Many high-value crops are sensitive to micro-climate variations such as temperature, rainfall, and soil moisture, which directly affect quality and profitability. Meanwhile, water and pesticides, which represent significant costs, are under greater scrutiny as governments and consumers place a higher priority on sustainability. Onset, a world leader in data loggers and weather stations, today announced that it is helping growers and researchers address these issues with the launch of the HOBOnet™ Field Monitoring System. Now, whether managing fields and greenhouses or conducting studies on agriculture, climate, or ecology, HOBOnet makes it simpler and more affordable than ever to collect the data that drives insights and decisions. The scalable, cost-effective HOBOnet Field Monitoring System includes everything needed to capture near real-time outdoor or greenhouse data. Based on the field-proven HOBO® RX3000 Remote Monitoring Station and powerful cloud-based HOBOlink™ software for remote system management, HOBOnet features a suite of new wireless sensors covering a range of outdoor measurements. The system connects the RX3000 and up to 50 wireless sensors in a mesh network in order to measure large areas once considered too costly or impractical to monitor. The HOBOnet Field Monitoring System provides access to data via any web browser, whether on a desktop, laptop, or mobile device, so growers and researchers can get timely information whenever and wherever they need it. 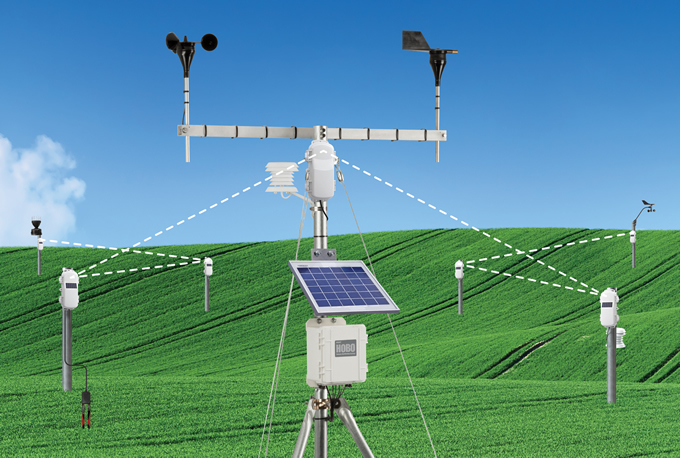 The HOBOnet Field Monitoring System features new wireless sensors for monitoring temperature, humidity, rain, wind, soil moisture, solar radiation, and PAR. These compact sensors include a built-in solar panel for battery charging and can be placed anywhere they’re needed, up to 1,500 feet apart, providing coverage for acres of land or groups of greenhouses. With the simple push of a button, the sensors connect and create an intelligent wireless mesh network that provides an adaptive and highly-reliable communication path for data to stream back to the RX3000 Remote Monitoring Station and to HOBOlink running in the cloud. The system eliminates the need for traditional cable and wires that always get in the way and can get damaged in the field. Plus, HOBOnet operates at 900MHz, which optimizes wireless communication through vegetation, and it allows for 50 wireless sensors to connect to the RX3000 and HOBOlink. At the heart of the HOBOnet system is Onset’s HOBO RX3000 Remote Monitoring Station, known for its easy setup, robust design, and research-grade accuracy. The RX3000 features flexible support for a broad range of wired and wireless sensors, an LCD display for easy field deployment, a rugged double-weatherproof enclosure, and 24/7 cloud-based data access through HOBOlink. HOBOlink is the web-enabled software platform that makes it easy to view data and manage the HOBOnet Field Monitoring System remotely. It works with the RX3000 Remote Monitoring Station and Onset’s new wireless sensors to provide growers and research scientists with instant access to site-specific environmental data anywhere, anytime from mobile or desktop devices. Delivered as a cloud service, HOBOlink features a customizable dashboard that enables instant visualization of current and historical data, plus the ability to set email or text alarm notifications when conditions reach user-set thresholds. It’s also integrated with Google Maps, so growers and researchers can quickly view the connection patterns for their HOBOnet system and details such as alarm status and readings from the last connection. The HOBOnet Field Monitoring System is available today. Pricing for the new wireless sensors starts at $189, with systems starting under $1,500. The monthly cellular data plan for the wireless sensor network ranges in price, depending on the user’s requirements. Additionally, current HOBO RX3000 Remote Monitoring Stations can be upgraded to the HOBOnet Field Monitoring System by adding the RX Manager and wireless sensors. An online configurator is available to help growers and researchers choose the system components that support their specific needs. Onset is a leading supplier of data loggers and monitoring solutions used to measure, record, and manage data for improving the environment and preserving the quality of temperature-sensitive products. Based on Cape Cod, Massachusetts, Onset has been designing and manufacturing its products on site since the company’s founding in 1981. Visit Onset on the web at http://www.onsetcomp.com.